Apple Peel 520 for iPod touch is now available for pre-order and shipping worldwide on October 4th via Peel520.net. This supplier, however, isn’t the official US retailer, and only importing the peripheral from Chinese manufacturer Yosion. If you don’t trust getting the product through this unofficial retailer, you can always wait until Go Solar USA brings the Apple Peel 520 to North American shores sometime in the near future. 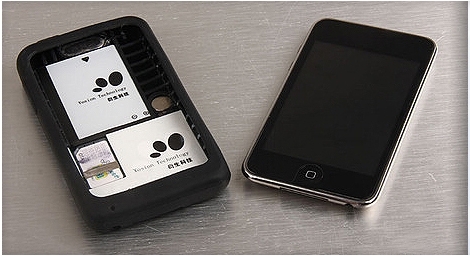 Apple Peel 520 is protective case for jailbroken iPod touch equipped with SIM card slot to add voice calling and text messaging capabilities to the device. The case also adds 4.5 hours of extra battery life, integrated microphone and speaker, charging port, and volume buttons. Apple Peel 520 works with jailbroken iPod Touch 1st, 2nd or 3rd generation with iOS 3.0 or higher, and requires an app to make and receive calls and SMS. The Apple Peel 520 is available now for pre-order through Peel520.net for $119, but is expected to cost $60 when the device is officially launched by US distributor Go Solar USA.